Who Profits is a leader in BDS efforts against Israeli and foreign companies. The NGO maintains a public database of businesses that are often targeted in international BDS campaigns. In 2017, total income was NIS 717,793; total expenses were NIS 782,628. 2014-2018 donors include: Trocaire (Ireland), Fagforbundet (Norwegian labor organization), DanChurchAid (Denmark), Bread for the World (Germany), Diakonia (Sweden), Medico International, ICCO (Netherlands), and Nova (Spain). Based on financial information submitted to the Israeli Registrar of Non-Profits, in accordance with the Israeli NGO transparency law, Who Profits received NIS 3,412,487 from foreign governmental bodies between the years 2014-2018 (see chart below for detailed funding information). Who Profits was founded “as a research project of the Coalition of Women for Peace (CWP) – a feminist, Palestinian-Jewish organization devoted to the struggle against the occupation…” and “in response to the Palestinian call for boycott, divestment and sanctions (BDS) movement” against Israel. Who Profits’ initiates international BDS campaigns, targeting Israeli and foreign banks, security companies, civil infrastructure facilities, and private companies. It supports BDS campaigns around the world in finding target companies. The website provides the option to “Report a Company,” and calls on the public “to identify companies that should be included in their database.” This database includes more than 500 Israeli and international businesses. Who Profits has participated in campaigns against Ahava, Airbnb, HP, and G4S. Who Profits and Coalition of Women for Peace co-authored a report titled “Knowing the Occupation Economy” (2015). 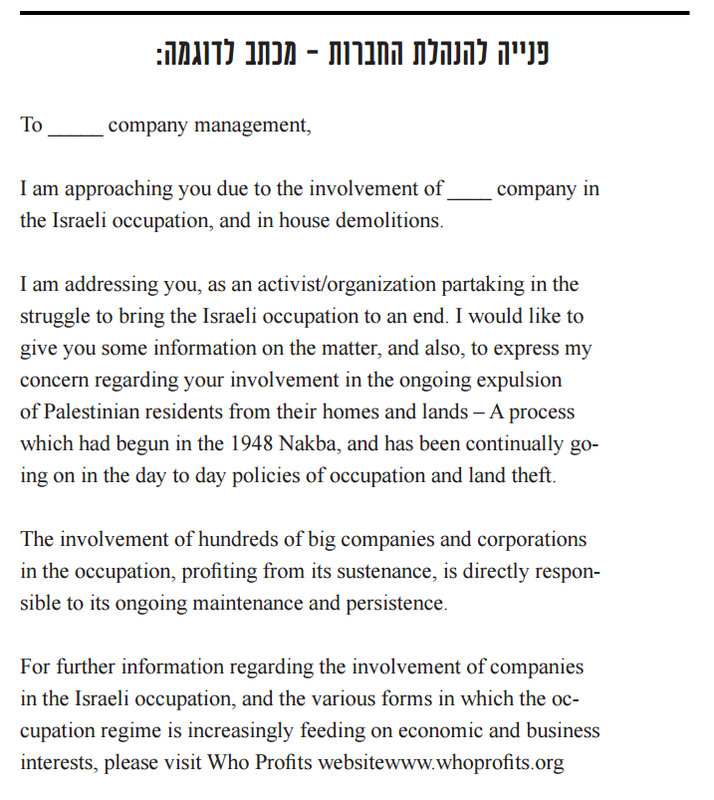 Who Profits attached a “sample letter” (see appendix 1) to the report under the title “contact company management.” The letter seeks to “bring to your attention your company’s involvement in the ongoing expulsion of Palestinian residents from their homes and lands- a process which beginning in the 1948 Nakba, and is continuously ongoing in the day to day policies of occupation and land theft” (emphasis added). Also calls for lobbying the EU to cancel the EU-Israel trade agreement relating to the Israeli pharmaceutical industry. Who Profits acts against small and medium businesses in Israel. NGO Monitor has acquired a number of letters sent in English from the “Who Profits staff” to Israeli businesses, informing them that they will be added to the NGO’s database (see appendix 2). The consequences of being added to this “database” include being targeted by BDS campaigners and being lobbied against in various international forums. In May 2015, Who Profits was part of a BDS campaign against the French telecom company Orange and its connections with the Israeli company Partner. Reflecting an extreme political agenda opposed to Israeli self-defense, Who Profits makes allegations that are completely unrelated to commercial involvement in the West Bank and Golan Heights: “As part of its social responsibility policy, the company sponsors two Israeli military units, the Ezuz armored battalion and the Shachar search and rescue unit, through the provision of sports days, entertainment activities and training. During the attack on Gaza in the summer of 2014, Partner was on the front lines providing material support, cellular services and entertainment to the Israeli soldiers. The company also waived service fees for soldiers during the 2014 assault” (emphasis added). Based on information provided by Who Profits, a large Dutch pension fund, PGGM, announced on January 8, 2014 that it will “no longer invest in five Israeli banks.” Who Profits, as well as a number of other highly politicized NGOs, lobbied PGGM to divest from these Israeli banks as part of its economic warfare campaign against Israel. Published a 2009 report alleging Norwegian Government Pension Fund investments with “corporations whose activities continuously support and maintain the Israeli occupation.” In the report, Elbit, which supplies unmanned aerial vehicles (UAVs), was described as “One of the main subcontractors for electronic detection systems in the separation fence and the seamline barrier for the Israeli Ministry of Defense.” Elbit’s role in preventing attacks against Israeli civilians was ignored. Who Profits does not publicize staff members on its website. Co-founder Dalit Baum was a former board member of radical Israeli NGO Zochrot, which was established with the aim of “rais[ing] public awareness of the Palestinian Nakba” and “recognizing and materializing the right of return,” meaning the end of Israel as a Jewish state. Baum is the Director of Economic Activism of the American Friends Service Committee (AFSC), which actively promotes BDS, utilizes “apartheid” analogies, and advocates the so-called Palestinian right of return. On June 30, 2017, Dalit Baum spoke at the UN Committee on the Exercise of the Inalienable Rights of the Palestinian People (CEIRPP) “Forum to Mark Fifty Years of Occupation,” stating that “the occupation continues because it really enjoys this ongoing tremendous support and impunity from every other country of the world, including individuals in the world that normalize the situation and treat it as nothing…people of the world are obliged to stop that support. To practice noncooperation, in other words BDS” (emphasis added). Other speakers included Wesam Ahmad (Al-Haq), Muna Haddad (Adalah), Omar Shakir (Human Rights Watch), Mustafa Barghouthi (Palestinian National Initiative), Jessica Nevo (Coalition of Women for Peace/Zochrot), Rebecca Vilkomerson (Jewish Voice for Peace), and Tania Hary (Gisha). Baum testified as an “expert” to the notorious “Russell Tribunal on Palestine,” a mock trial putting Israel and its Western allies “on trial” and promoting “existing legal actions and campaigns in the context of BDS to be stepped up and widened within the EU and globally” against Israel. Other panelists included members from Al-Haq, BADIL, the Boycott National Committee, and the Palestinian Farmers Union. 2014-2016 figures based on NGO annual reports, 2017-2018 figures based on quarterly reports submitted to the Israeli Registrar for Non-Profits. CWP is a leader in the boycotts, divestments, and sanctions (BDS) movement against Israel, primarily through its Who Profits project. Campaigns include the UC Berkeley divestment effort (2010), the Norwegian Governments Pension Fund which led to divestment from Elbit, and targeting of banks, security companies, civil infrastructure facilities, and private firms.